I can not begin to tell you how much I enjoy Sunday’s. It is mine and Agent Wade’s day to spend together. She is a delight. My husband Spanky also participates in the action if nothing more than being in the sewing room using his computer and watching TV. Just the fact he decides to be “one of the girls” for the day. He is a wonderful husband. Yesterday was a fairly good day. We did have some issues. First I was starting a UTI and we all know that is not a good thing. I got that under control really fast. I felt terrible but I trekked along. It had been two weeks since Agent Wade had been here eliminating UFOs and I was determined to enjoy the day. I did. 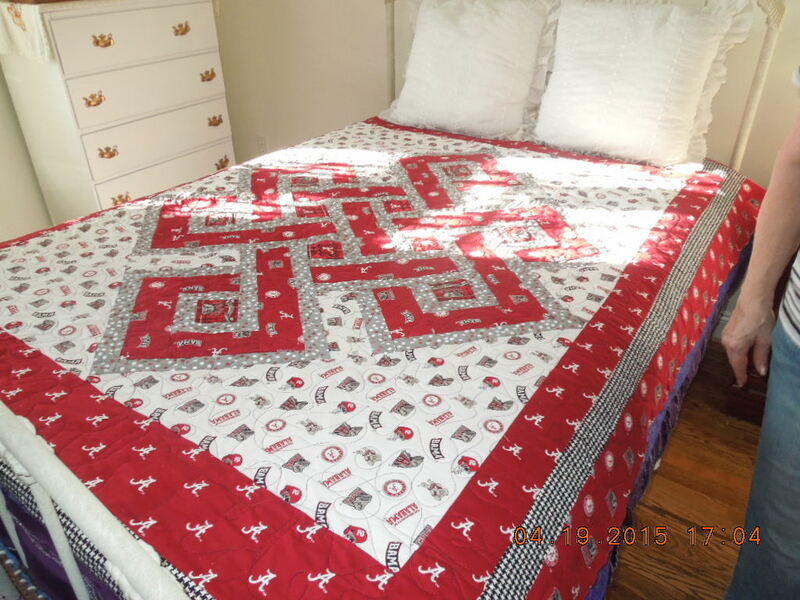 She brought her son’s quilt and for the record we’ll refer to him as “J.” Well as she worked on J’s quilt we discovered several things about our Tin Lizzie 18 LS. One she does not like old thread and I do not mean really old just a few years old and two she did not like Agent W’s Alabama quilt. Do you all think because this is an Auburn University house and Lizzie was working on an Alabama quilt she decided to cut up!!! I think it was a variation of a couple of things. The King Tut thread I have had for several years and then the fabric some of the pieces was not 100 % cotton. The tread broke about twenty times we adjusted tensions time after time and then after she finished with her beautiful quilt for J we loaded a practice test piece on it and it worked like a charm. Go figure that one. So we just assume it was the old thread since on the practice piece we changed threads and the type of fabric. Well we got through it and I always prepare us something for dinner and we had the best taco salads I think on earth. 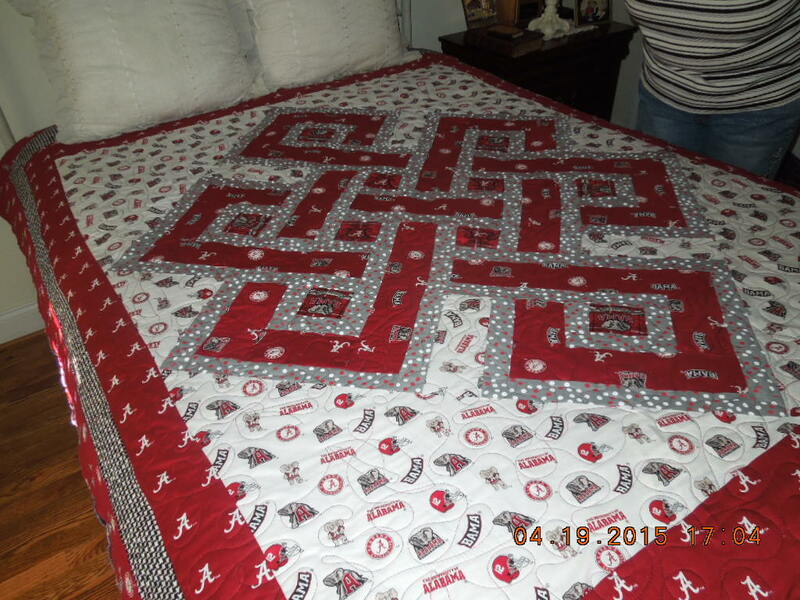 Good company, three great friends and one beautiful quilt and it is so hard for me to say that because I am an Auburn Fan. Just kidding. 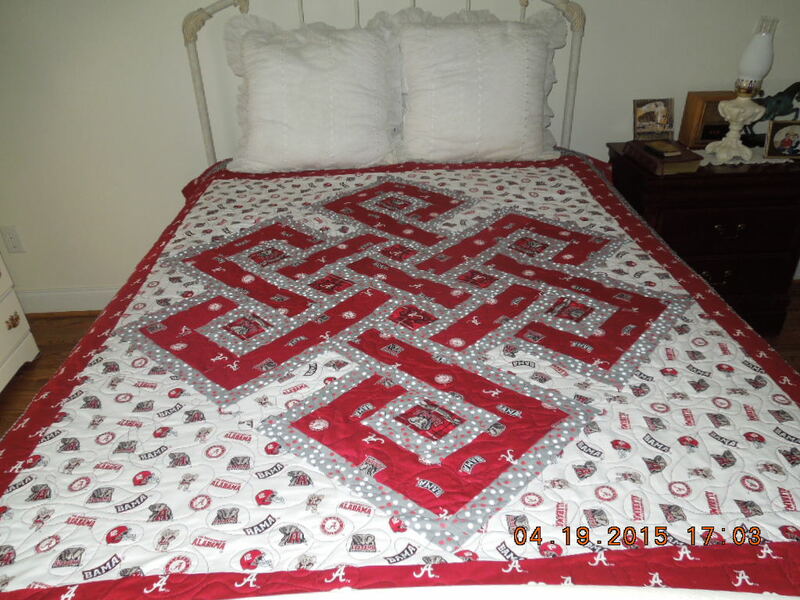 I did really think it was lovely and she can quilt all the Alabama quilts on it she wants to. That is what friends are for! We put our differences aside when it comes to friendship and quilting. I guess one really good thing I like about Agent Wade and our Sunday quilting is when she walks through the door we leave politics, religion, football preferences (I do not even know what her favorite team is) anything drama at the front door. We just enjoy each other and our learning process. I have found so many times when you get involved with guilds,classes or whatever the hobby you may choose and you decide to go be a part of something it is drama. I wonder why a bunch of women think when they get together to sew, knit, crochet, embroidery, cook or whatever they have to always discuss politics, religions, family, DRAMA, and such. Why can’t you just go enjoy being there working on your project and leave the rest of the crap where it belongs.. ON THE OUTSIDE. I have decided I am going to go on a drama diet. I am not listening to it or participating in it. Oh I did not mean to get off on my rant! I just wanted to express how much Agent W and W enjoy each others company and the only thing we discuss is what we are going to work on next and our currents project. HEAVEN ON EARTH. This was really a beautiful quilt. The glitter part was not glitter it was gray polka dots but I think the camera captured it at an angle and it looks glittery. And that does give me an idea about another quilt using glittery fabric. I opened the shades in the room a tad and the light shown in but still you can see how pretty the quilt. It is only apropos to have a UFO landing site outside your home if you are going give them a place to land. 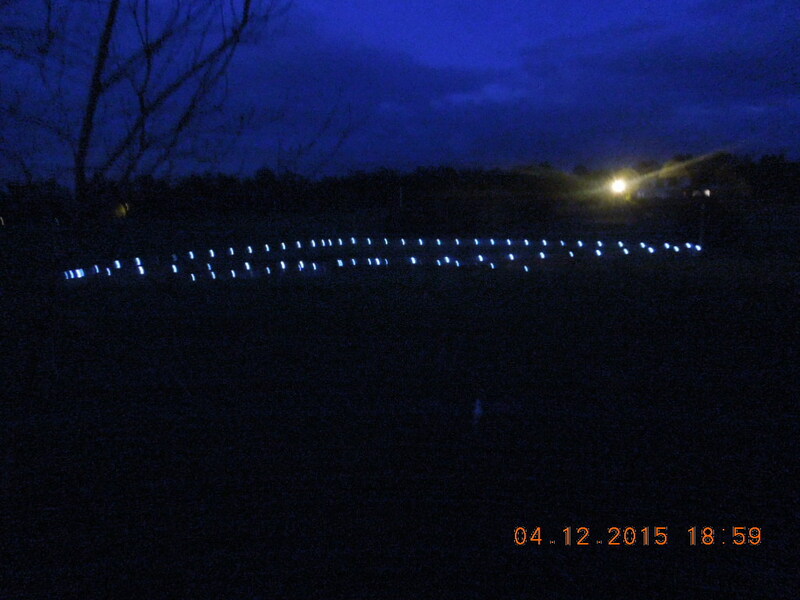 This is our pond and a night shot of the solar lights we have around the pond. Wait I see one landing now!!!!! Until next time. Be happy go on a DRAMA DIET and enjoy whatever love you have. 3 Responses to Another UFO Bites The Dust. VERY good ladies, but you two always do good. Sorry I was unable to be there to IRON for you. Maybe next time!!!! 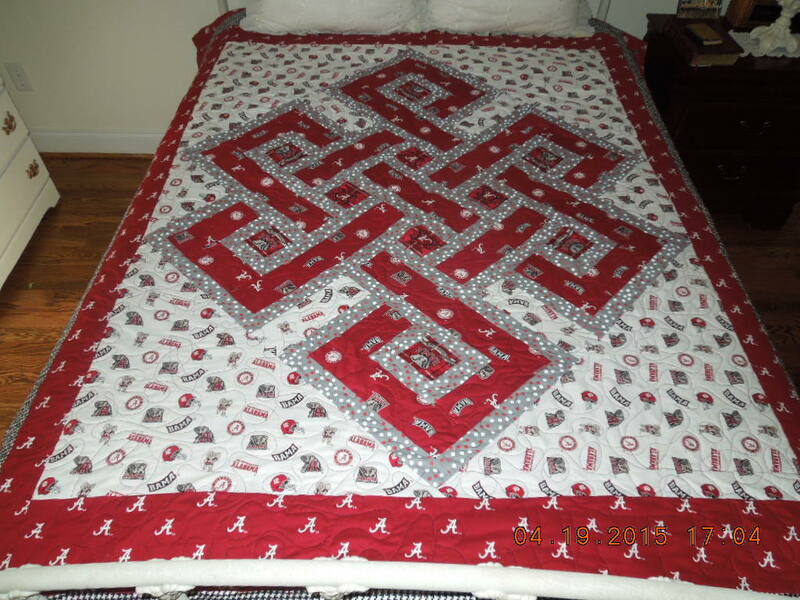 What pattern is ‘J’s’ quilt? That is a great pattern. Now you have me humming to Queen (Another one Bites the Dust). I’ll be humming it all day, I’m sure. And yes, politics need to stay out of the sewing room.